It was the second rainy weekend in a row in New York City, but a crowd of guys made it down to the Metropolitan Wargamers club in Brooklyn Sunday afternoon. With seven of us standing around the table trying to come up with a big enough game with easy rules that could be played in a couple hours, a few people tossed out the idea of 2008’s Pacific Typhoon by GMT Games. 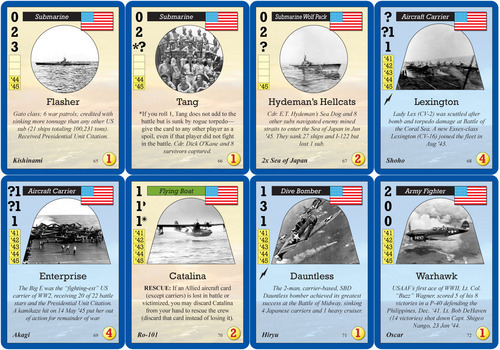 This WWII Pacific Theater naval battle card game was originally produced as a sequel of sorts to Avalon Hill’s Atlantic Storm game from the late 1990’s. Created for 3-7 players ages 10 and up, Pacific Typhoon is simple to grasp with a pretty straightforward trick-taking format yet enough opportunity for interaction among players to keep a group of hearty experienced gamers engaged for the afternoon. Pacific Typhoon comes with 140 force cards and 40 battle cards plus a couple dice and a rulebook, making this a compact and entertaining game for medium to large groups. The cards themselves are simple but have nice black-and-white WWII period photos and contextual factoids which add flavor to the game. Plus, at just $20 direct from GMT Games, Pacific Typhoon carries a lot of fun at a really friendly price. Each player begins by drawing a hand of six force cards. 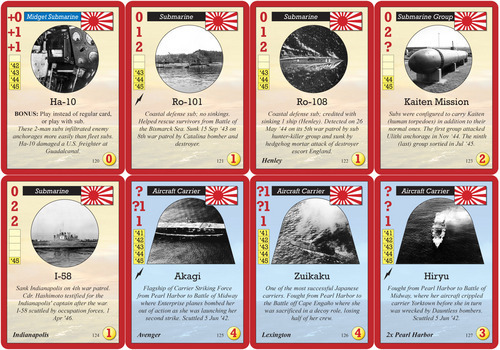 Cards depict historical Japanese (red, top left) and Allied (blue, middle left) naval forces plus upgrade and event cards. The starting player draws two battle cards (black-edged, bottom left) and chooses one of the two to play. Play goes around with each player choosing in turn to commit a Japanese or Allied force card to the battle. Players contribute the points on their cards to the total strength of each side in the battle, and the side with the most points wins that battle. The player with the highest point value on the winning side then divies up the points among the winning players, and the next round begins. As described above, the play is really straightforward but there’s a lot of flexible play in each round. 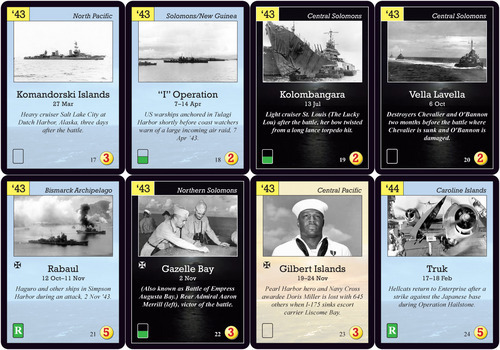 Battle cards take place in a specific year (’41, ’42, 43, etc.) and during day or night. The player choosing the battle also calls whether the battle is to be fought with submarines, on the surface or by air. A battle combination such as “night battle, surface, ’44” will determine which force cards the players can choose to play in the battle. With force cards with varying levels of strength, bonuses, year, time of day and type, each battle plays out differently. Alliances among players are created and broken with each battle, with players choosing which side to support as a gamble toward contributing to whichever side will win. For example, a turn may start with Japanese cards being played to what looks like a certain victory until a group of subsequent players decide to pool their Allied cards and win in an upset. As the game progresses, winning players dole out points rewarding their allies in each round while making certain to hold enough points for themselves ahead of the whole group at the game’s end. With alliances and double-crosses sailing back and forth over the table in each round, Pacific Typhoon is a game rife with good-natured team-play and trash-talking. 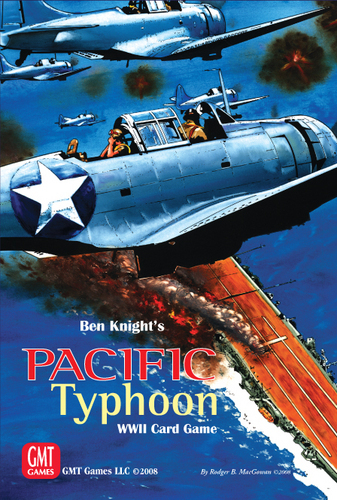 Pacific Typhoon ultimately makes for a great mix of individual and collaborative play within a casual trick-taking card game good for beginners and experts alike interested in spending a couple hours re-fighting famed WWII battles of the Pacific high seas.